The Dome of the Rock sits on the Temple Mount in Jerusalem. The First Temple, built by Solomon, stood on more or less the same spot, on high ground which sloped southward down the valley. After the destruction of the First Temple by the Babylonians, the Jewish population were exiled to Babylon, where the Babylonians were themselves conquered by the Persians, who allowed the Jews to return home some 70 years after their exile. The temple was reconstructed and there then followed a number of invasions and conquests culminating in the rebuilding of the temple (the Second Temple) on a larger scale by Herod, at which time the Temple Mount was constructed as a broad plaza over a series of arches, surrounded by supporting retaining walls. The Western Wall at which Jews pray, is the western retaining wall of this plaza. From the south and east it is clear to see that the plaza stands high and level above the surrounding land. The Second Temple was destroyed by the Romans in 70 C.E., and the Jews exiled. The Romans built a temple on the site and subsequently a Christian church. 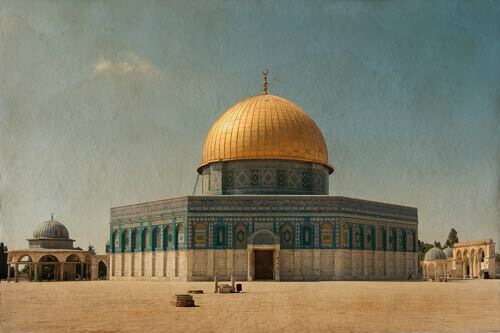 When Islam became the dominant religion in the region, the Dome of the Rock was constructed to mark the spot where Mohammed ascended in a dream to heaven. During the crusades the building became the focal point for the Knights Templar until Jerusalem was regained by the Moslems. The organization of the plaza and of the buildings on it, is now run by the Waqf, who have built an extension to the Al Aqsa mosque (which sits at the southern end of the plaza) and have another in the planning stage. The mosques attract large congregations on Fridays. Nikon D200 with 12-24mm lens at 24mm. Layer blended over scanned sheet of art paper previously soaked in coffee.